NextWhy you shouldn’t skip Auckland! One of the best parts of travelling is discovering new food. Savouring delicacies at roadside stalls, trying an exotic fruit for the first time, or just wandering through a supermarket marvelling at how different everything is. Reading the unfamiliar brand names, some of which get amusingly lost in translation. And the snacks! All those brightly coloured packages with strange cartoon mascots and questionable artificial flavourings. Luckily, New Zealand is so culturally diverse it’s easy to find pretty much any style of cuisine, especially in the bigger cities. And as a small farming nation, we have plenty of quality fresh produce available, from grass-fed beef and our famous lamb to freshly-caught seafood, and fruit and vegetables aplenty. But if you’re looking to try some weird Kiwi foods, we’ve collected the best of them right here. These are just some examples of unique New Zealand food you just have to try while you’re in our country. What are New Zealand pies? Elsewhere in the world, a pie is most likely to have a sweet filling and be served by the slice. But in New Zealand, when we say pie we mean one thing: A single-serve pastry delight, piping hot and filled with meat. Fresh from the pie-warmer and slung into a paper bag, it’s the perfect meal on the go. Tomato sauce (aka ketchup) optional. There are many flavours of pie but the most popular are steak or mince with cheese. There are regional specialties too – look out for lamb and kumara (sweet potato) pies, or smoked fish pies, depending on where you travel. That’s right, we take our pies so seriously that they come with an official police warning. You can also buy meat pies in Australia but to be totally honest and not at all biased, New Zealand pies are just better. In fact, a few years back one of our most famous pie companies got told they couldn’t export their pies to Australia, because they had too MUCH meat in them compared to the average Aussie pie. That’s fine, we’ll keep our delicious meaty pies to ourselves, cobbers. How to eat a pie: Any time is pie time! Breakfast, lunch, dinner or just as a snack. What is a sausage roll? If you’re from the UK, Australia or elsewhere in the Commonwealth, sausage rolls are perfectly familiar. For everyone else, a sausage roll is a savoury bit of pork sausage meat, shaped like a cylinder and wrapped in flaky pastry. It’s basically the pie’s funny-looking cousin. How to eat a sausage roll: Eaten on the go like a pie, or served in bite-size pieces at parties. A uniquely Kiwi soft drink (aka soda or pop, depending on where you’re from). The name is short for Lemon & Paeroa, Paeroa being the small North Island town where it was originally made from local mineral spring water. Today this fizzy drink with its distinctive lemony-but-not-lemonade taste is made and bottled by the Coca-Cola company, but it’s still a beloved Kiwi institution. Paeroa is a convenient pit stop if you’re travelling anywhere south of Auckland, including Hamilton, the Coromandel, Waihi, Tauranga or Matamata. 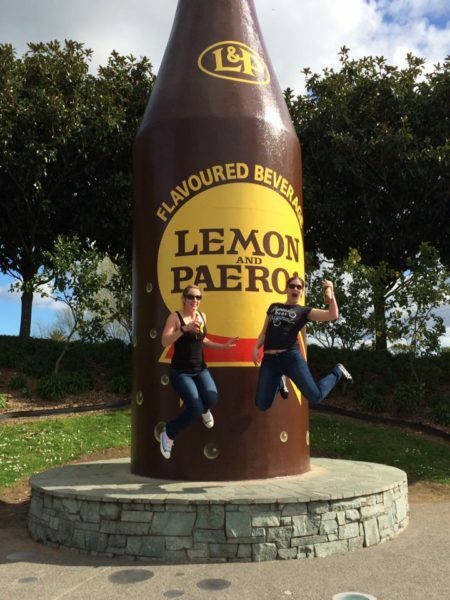 Grab a bottle or can and pose for a photo with the giant L&P bottle on the way out of town! How to drink L&P: It’s the perfect accompaniment to a pie, or with fish & chips at a picnic on the beach. While we’re on the subject of things we do better than Australia, let’s talk about the pavlova. This delicious dessert is the source of yet more Kiwi-Aussie rivalry, as both nations claim to have invented it. It is named after the famous Russian prima ballerina Anna Pavlova, and a chef in a Wellington hotel invented it in her honour while she was visiting New Zealand on tour in 1926. A pavlova is a large round meringue the size of a cake, with a flat top. It is traditionally covered with whipped cream and served with fruit on top – usually berries or sliced kiwifruit (another New Zealand icon!). 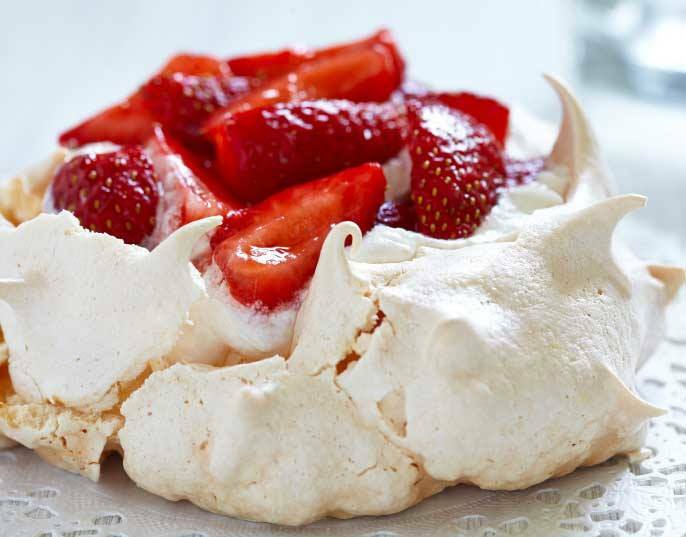 You can buy ready-made pavlovas in the supermarket and add your own toppings, but a homemade one can’t be beaten. That crunchy shell on the outside, the soft marshmallow-like consistency inside, the sweetness tempered by whipped cream and tart fruit… perfection. Whitebait are the fry (juveniles) of small freshwater fish, found in rivers and streams as they make their way upstream after spawning at sea. Kiwis catch whitebait in nets and fry them up into a seasonal delicacy: the humble whitebait fritter. Everyone has their preferred recipe and debate still rages over whether or not to add flour, but the chief ingredients are simply egg whites salt and pepper. How to eat whitebait fritters: At a roadside stall if possible, with a slice of lemon squeezed over the top and toast on the side. A hangi is a traditional Māori meal, cooked below the ground in an umu or earth oven. Cooking a hangi is a team exercise requiring plenty of willing helpers. First, place large volcanic stones in a deep pit over a wood fire and heat them up. Then place covered baskets of meat and vegetables over the top, replace the earth on top and leave your meal to steam and roast for several hours. The result is a deliciously tender, smoky-tasting meal. How to eat a hangi: At someone’s house, at a marae or a roadside stall. It’s a great way to learn about Māori culture. Hokey pokey is honeycomb toffee, but with a much cooler name. We like this crunchy, foamy concoction so much we’ll put it in pretty much anything. The most iconic way to eat hokey pokey, though, is in ice cream form. A scoop or two of vanilla ice cream studded with these golden gems, served in a wafer cone, is the best way to enjoy New Zealand ice cream (and brings back memories of childhood summers). Hokey pokey is also the main ingredient in the delicious Crunchie bar. How to eat hokey pokey: In an ice cream or Crunchie bar. Little bite-size treats made from a chewy pineapple-flavoured centre with a chocolate coating. The consistency is hard to describe – it’s kind of fluffy, harder than marshmallow but softer than toffee. You can buy pineapple lumps at any supermarket or dairy in family-size packets and share the fun. They’re also very good frozen! How to eat pineapple lumps: Shared with friends. What is a chocolate fish? Don’t worry, there is no real fish involved in this sweet treat. We’re not THAT weird. This beloved Kiwi treat is a pink fish-shaped marshmallow, covered in chocolate. How to eat a chocolate fish: As a reward for a job well done, or served alongside a hot chocolate or coffee. Dunk the chocolate fish into your hot drink and enjoy the gooey chocolate and melted marshmallow hit! Pink, yellow and green soft chewy sweets, shaped like cartoon Eskimo people. These colourful treats sparked controversy a few years back due to their potentially offensive depiction of the Inuit people of North America, but the name remains. And it’s a good thing too, because without them we wouldn’t have lolly cake! How to eat Eskimo lollies: In lolly cake (see below) or nibbled on their own. Also known as lolly cake, lolly log or lolly slice, this garish delicacy is a staple at children’s birthday parties and other casual gatherings. It’s also easy to make! 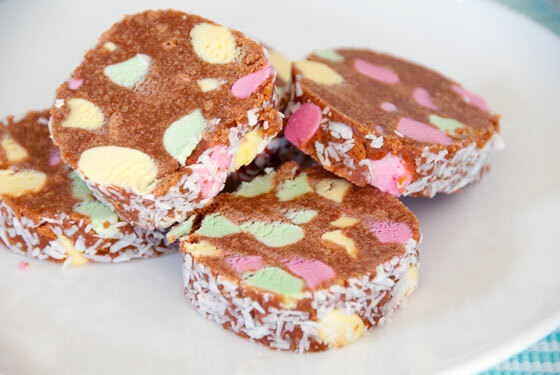 Lolly cake is made of crushed biscuits and melted butter, mixed with chopped-up Eskimo lollies (see above) and compressed into a log shape. It’s then rolled in coconut and served by the slice. How to eat lolly cake: At a party, or with a cup of tea or coffee. We’ve saved the best til last. The larvae of the native huhu beetle, this traditional Māori snack is not for the faint-hearted. Huhu grubs live in rotten logs and apparently taste like either chicken or peanut butter, depending on who you’re talking to. How to eat huhu grubs: In the bush (forest) or at the annual Hokitika Wild Food Festival, a celebration of unusual New Zealand foods. You can eat them raw or cooked. So there you have it: our list of some of the top unique New Zealand foods, where to find them and how to eat them. If there’s a weird Kiwi food you’ve encountered on your travels, tell us about it in the comments!